Ukraine needs to switch to the European model of a parliamentary-presidential republic before the next regular elections in 2019, the chairman of the political council of the People's Front Party and former Ukrainian premier, Arseniy Yatseniuk, has said. "The country cannot depend on the surnames of the president, prime minister, coalition members. The country should depend only on institutions. We build our country for our children, and these institutions must be accountable to the people. We can do this until the next regular elections - to ensure a full European model of a parliamentary-presidential republic," he said at a party congress in Kyiv on Saturday. In his opinion, the current parliament can change the law on the Cabinet of Ministers and bring all powers of the president into line with the constitution. "I appeal to our partners in the parliamentary coalition and personally to [Ukrainian President] Petro Oleksiyovych [Poroshenko]. We can do it. 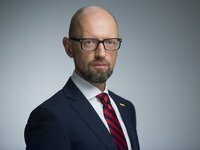 We can ensure the European model of a parliamentary-presidential country before the next presidential and parliamentary elections," Yatseniuk said.